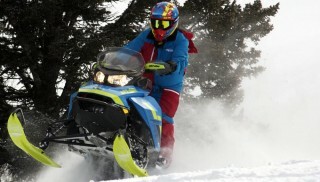 Seeking a backcounty freestyle crossover snowmobile for the flatlands? Something shorter than a bus? Then the 2018 Ski-Doo 850 Freeride 137 is your sled. 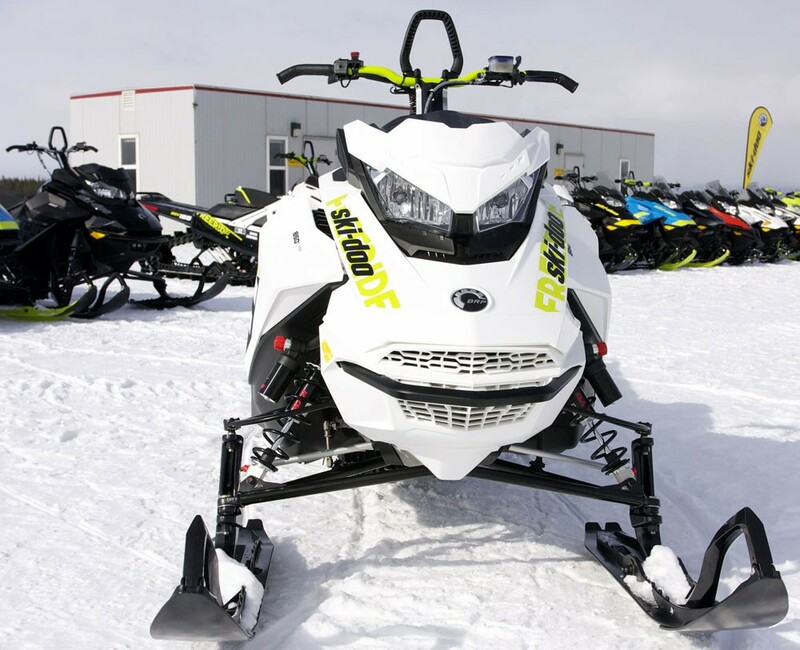 Ski-Doo’s 2018 Gen4 850 Freeride line covers three types of riders. First is the deep powder rider who chases the steep-and-deep aboard the longer Freeride 154, 154 S-38, and 165 models. Second, is the freestylist who is partial trail, meadow and deep-powder, this is the 146 Freeride rider. Third, is the flatlander Metal Mulisha type, who wants “different.” The 137 Freeride attracts those who want to fit in, while at the same time, not wanting to fit in – no one tells them what is or is not, a trail or crossover snowmobile. 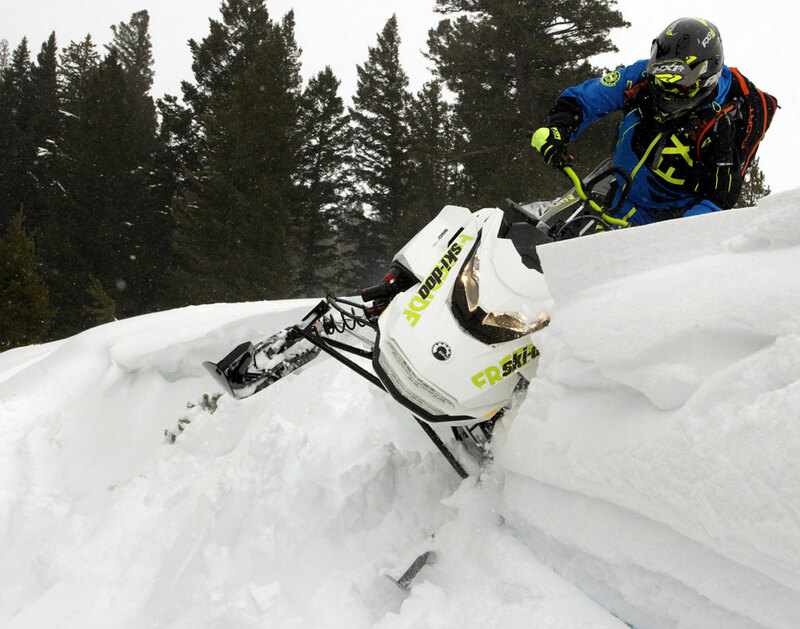 This, the last in our many features on deep-powder specific crossover snowmobiles, closes out our discussion on who the crossover driver is. What then, is the 2018 Ski-Doo 850 Freeride 137’s purpose relative to the Gen4 850 Renegade X-RS, X, and Adrenaline, all of which are 137s as well? The three Gen4 137 Renegades mentioned above are trail-specific with wide RAS-3 front ends, a molded seat built for all-day-long sitting, adjustable handlebars designed to tilt forward and rearward for fast or slow trail maneuvering, and cockpit ergonomics engineered for an upright sit-tall position. All Gen4 Renegades are assembled with Ski-Doo’s rMotion rear suspension. It’s the shock packages and track choices that separate the three. The wound-tight 2018 Ski-Doo 850 Freeride 137 comes with a one-inch wider track, spanning 16-inches, compared to the Renegade’s 15-inches. This track is Ski-Doo’s famed PowderMax with FlexEdge technology where its reinforcement rods are only 14-inches wide, leaving the outer one-inch edge pliable enough to flex against a hillside – to assure maximum contact to a hillside’s surface. Track lugs are also taller than those on the Gen4 Renegades, 1.75-inches versus 1.25-inches. Ski stance is narrower with the Freeride 137 having an adjustable 38.4-inches or 40.2-inches, whereas the Renegade models is fixed at 42-inches. Like the Renegade, the Freeride 137 relies on rMotion for deep bump soak after the RAS-3 front suspension receives and softens initial impact. Track width on the Freeride 137 is adjustable: 38.4 or 40.2 inches. 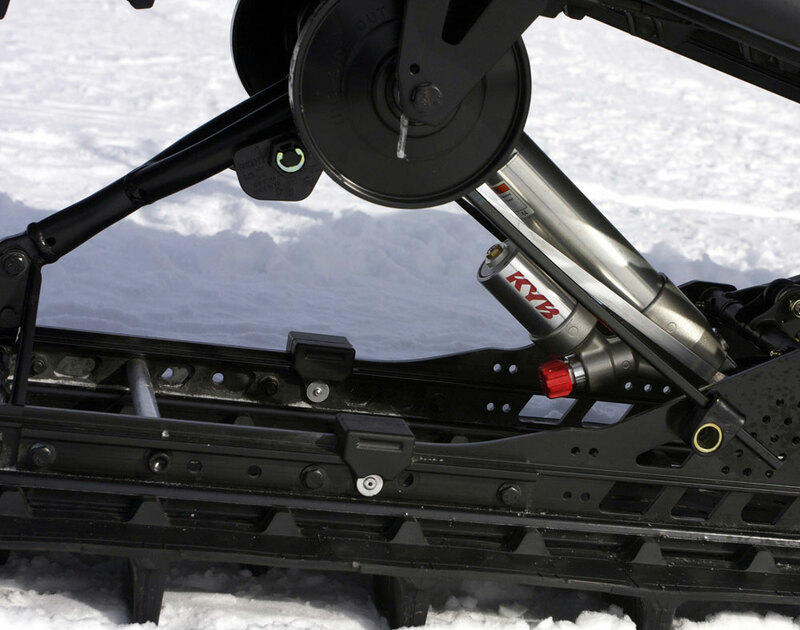 Ski-Doo has two rear suspensions for its deep powder, trail and crossover lines. First is tMotion (as used on Summit and long track Freeride models) which is wholly designed for deep powder. For trail and crossover use is rMotion, a hybrid rear suspension built from tMotion and the former fast-attack trail, cMotion. The 137 is the only Freeride model equipped with rMotion, the other Freerides track on tMotion. The 2018 Ski-Doo 850 Freeride 137 relies on KYB Pro 36 R Easy-Adjust shocks for the RAS-3 front suspension; front end travel is 8.7-inches. The rMotion rear suspension for this short Freeride is assembled with two KYB Pro 40 Easy-Adjust shocks, one for center rail front the other for rear rail; rear suspension travel is 10.6-inches. KYB Pro 40 Easy-Adjust shocks control 10.6 inches of rear suspension travel. 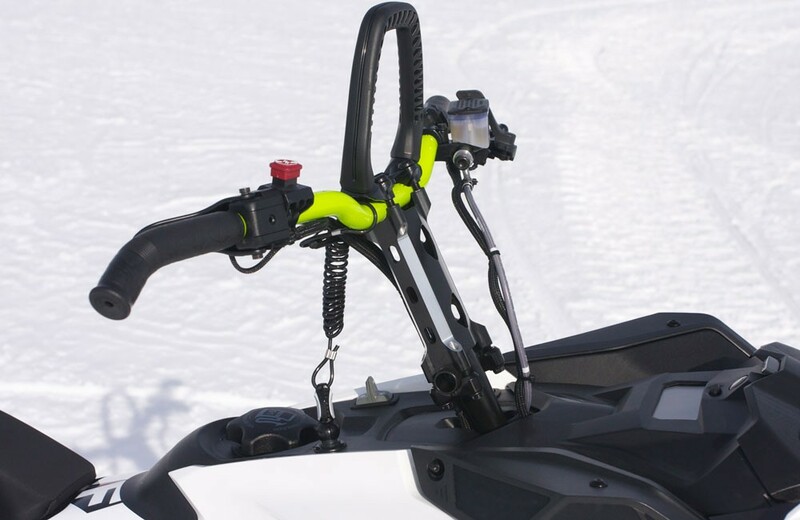 With the Renegade built for riders who spend most their driving time in a seated position, Ski-Doo’s engineers set the 2018 137 Freeride for standup riding, complement its almost-vertical handlebar post, 5.7-inch riser block, narrow bars, center-pull mountain strap and J-hooks. The Freeride 137’s cockpit area is identical to its longer deep-powder siblings. To summarize the above: Although the 137 Renegades and the Freeride 137 share much the same dimensions, the Freeride 137 has a wider and taller track, narrower front end, shorter and narrower mountain seat, open running boards with saw-toothed edges, and a cockpit designed for stand up riding. 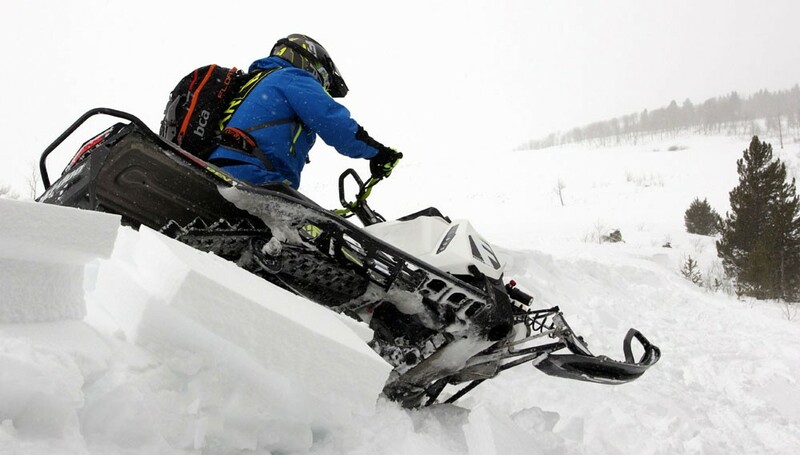 Ski-Doo engineers equipped the Freeride 137 with a 5.7-inch riser block, narrow bars and a center-pull mountain strap. 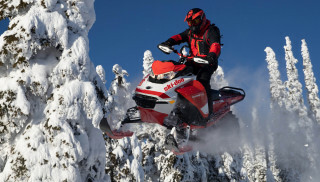 The Freeride is powered by Ski-Doo’s 850 twin cylinder two stroke motor with direct electronic injection. This motor is rated for approximately 165 horsepower, corrected for sea level. Its drivetrain is made up of pDrive with the drive clutch with QRS as the driven clutch. Engagement speed is 3,800 RPM. The Freeride’s large drive sprocket has 45-teeth whereas the small sprocket has eight. The track driver is 7.2-inches in diameter. What we learned from a day’s work on the Freeride 137 is that with its rMotion rear suspension and RAS-3 front end, it is sure-footed and stable on the trails. As junk whoops roll under the Gen4 chassis, the two suspensions work in tandem to keep ski scrub and lift to a minimum. But, being the 137 Freeride has a narrow front end and its handlebars are configured for standup riding, outside ski lift is more apparent than a Renegade’s, which means when the Freeride is deep into a corner’s apex, the driver has to bleed off some speed to settle the front end down before squeezing the throttle open. This is where a 137 Renegade will launch ahead of the Freeride 137 as its wider front end, trail-specific skis, and a cockpit built for cornering, give the rider permission to lean and be aggressive from their seated position. Conversely, what happens when rider #1 on a 137 Renegade X-RS and rider #2 on a 137 Freeride, roll off the trail together and into 12-inches of powder covering some sweet rolling hills? Here the table turns. The Freeride 137, with its wider and taller track, and wider- and deeper-keel Pilot DS 2 (“DS” for deep snow) powder skis, will rapidly pull ahead of the Renegade X-RS; the Freeride is designed with powder play in mind. Given all of the aforementioned comparisons, the Freeride 137 is a short crossover snowmobile, by crossover snowmobile standards. Meaning, Ski-Doo’s 146 Freeride may be the better choice if you plan to explore some Rocky Mountain backcountry. 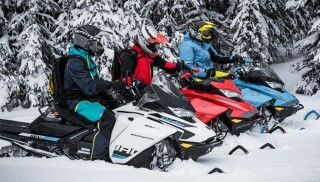 In other words: When choosing a crossover snowmobile, especially in the Freeride line, study the differences between the two track lengths – 146 versus 137; the longer the track, the greater the floatation. Now, we had fun making the 2018 Ski-Doo 850 Freeride 137 behave like a mountain and crossover snowmobile. We threw it into the deep end of a mountain and made it swim. It did gasp for air a few times as we pushed it through some marginally-deep powder on some steep slopes. We would have liked more foot print under the Gen4 chassis, but we learned to make it perform as intended. As the mountain team for Snowmobile.Com, we do gravitate to the steep-and-deep. However we can settle down long enough to flog a crossover snowmobile in its backyard. So what is the 137 Freeride’s playground? It is mostly trail where the trail leads to some January powder up to a foot deep. Now, we toss in one last bit of Freeride info, something 2018 Gen4 Renegade owners can’t have: SHOT – Start Hot. 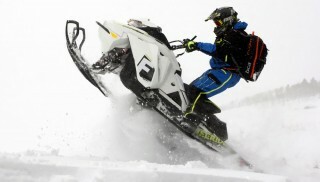 Freeride owners can equip their snowmobile with Ski-Doo’s 25-pound electric start kit, but why when a large capacitor, fast-dump electronic start is available which only adds a claimed seven pounds to the Freeride’s dry weight of 476. On the down side, SHOT starting was only a Spring-buy option and it appears that its time has come and gone. Hopefully dealers ordered their Fall inventory of 137 Freerides with SHOT. Conversely, all 2018 850 Gen4 Renegade models come equipped with normal electric start as standard equipment, Spring-buy or not. In closing, the 2018 Ski-Doo 850 Freeride 137 is for the rider who has robust short track DNA, but who now and then sips some Rocky Mountain deep-powder elixir. Basically, it is for the short track rider who wants to be unique.